After reading all the good things about beer in soap, I naturally wanted to make my own. I was already fantasizing that this would be my pièce de résistance. The timing could not have been better. My new acrylic mold had just arrived. 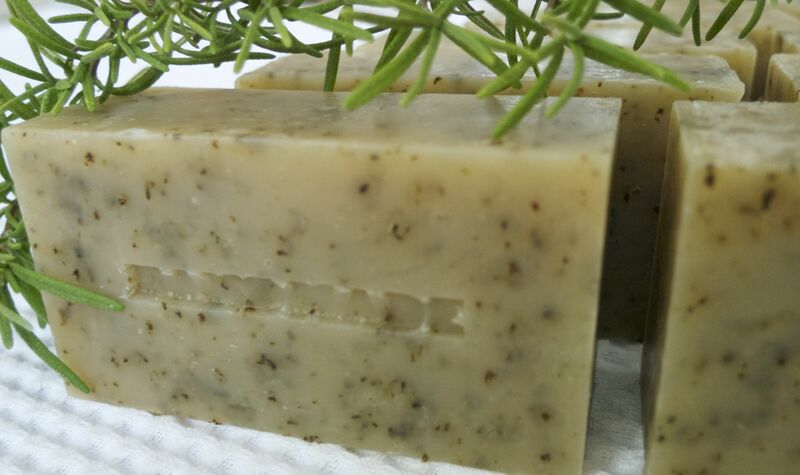 I originally did not plan on scenting this soap, except for the rosemary I had air-dried more than a month ago. I only had lavender, peppermint and eucalyptus e.o.’s – not exactly a good beer match, in my opinion. If I had a choice, I would have used something fresh and citrusy, or something manly like leather or tobacco. As expected, the beer and lye solution smelled nasty. I read that the smell eventually goes away, but I did not have full faith that it would, so at the last minute, I added 15 ml of each e.o. I had on hand. I increased the liquid percentage for this batch because I did not want to waste the beer. It reached light-medium trace quickly but did not get much thicker even after I added the rosemary and essential oils. It behaved very well and gave me plenty of time to mix thoroughly. Twenty six hours later and with much anticipation, I was able to easily slide off the acrylic mold from the soap. My heart dropped a little when I touched the surface moisture and it was oil. I am 99.9% sure I mixed it properly. Could it be from the acrylic cover I placed directly on the surface of the soap? Maybe it couldn’t breathe? Was I supposed to let it breathe? Maybe it needed time alone…. It looks like there is a pool of oil, but it’s partly air pockets. The following morning, I was a bit relieved to see that more than half of the oily sweat had been reabsorbed. Maybe 45 ml of e.o. was too much for 800 grams of oil, not to mention there’s the fat from the yolk, on top of the 5% lye discount??? This loaf was a bit on the soft side but sliced beautifully. 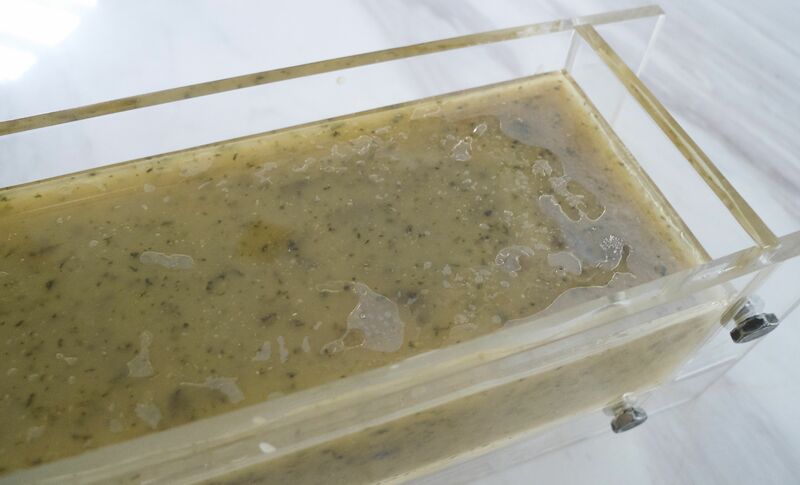 Fortunately, the oil was limited to the surface of the soap, and no pockets were to be found in the middle. Even with all the e.o’s, I could still smell the beer – not a very pleasant scent combination. It has already been a couple of weeks, and so far so good. The beer smell is definitely a lot fainter. This is my first time to use sodium lactate. I could not find it anywhere, until I was able to persuade a soap manufacturer to sell me some. Even then it took them a few weeks to sell to me because they had to find a small container that was compliant with their standards. Right now I can’t tell if the sodium lactate has made any difference. This entry was posted in All-Natural, Cold Process and tagged Beer, Cold Process, Sodium Lactate on May 26, 2013 by soapjam. Sodium lactate is supposed to give you a harder bar of soap that will last longer in the shower. The soap is just 2 weeks old. It is firm but it still gives when I press hard. I was thinking of using this as a body soap. Will this spoil fast because of the egg?